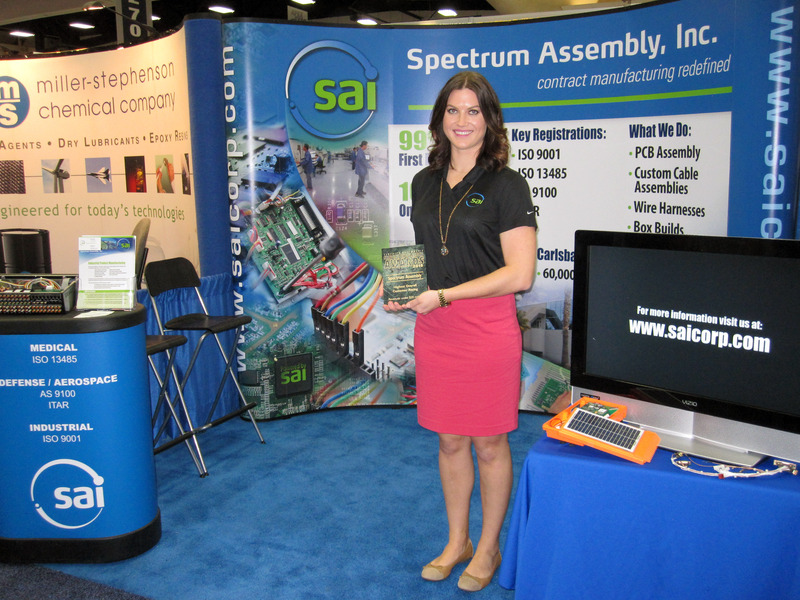 Spectrum Assembly’s Sales & Marketing Manager Alexandra Topp holds SAI’s Service Excellence Award in their booth at IPC APEX Expo. Spectrum Assembly Inc. won the top award for EMS companies with revenues under $20 million at the 2015 Service Excellence Awards (SEA) for Electronics Manufacturing Services (EMS) providers. The awards program was sponsored by Circuits Assembly magazine and recognized EMS companies that received the highest customer service ratings as judged by their own customers. The ceremony was held on Feb. 24, at the IPC APEX Expo in San Diego, CA. “This is a tremendous honor. While we’ve won awards in individual categories in prior years, this is the first time we’ve won the overall award in our revenue segment. It says a great deal about the dedication of our team, as we were in the middle of expanding our operations during the survey period last year and everyone was doing their regular jobs, plus the added work that comes with moving work cells and re-laying out lines. I appreciate the high ratings our customers have given us and we look forward to continuing to deliver the exemplary service they expect,” said Mike Baldwin, Spectrum Assembly, Inc.’s Vice President. This is the fourth year in a row SAI has won a SEA award. SAI previously won a SEA for Technology in 2014, SEAs for Dependability and Responsiveness in 2013 and SEAs for Dependability, Responsiveness and Quality in 2012.